It's always a pleasure seeing an author get better. In our last episode, I gave a less-than-enthusiastic review to The Blue Sword and so was a little hesitant to begin this book. But there were enough good points about McKinley's writing that I wasn't dreading the experience. 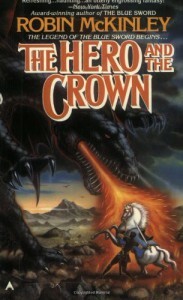 As it turns out, I enjoyed The Hero and the Crown much more than The Blue Sword. The story revolves around Arlbeth's (the king of Damar) daughter, Aerin, whose mother was a woman from the North (in McKinley's world, the North is a land of demons and half-human creatures, and Aerin's lineage makes her suspect in the eyes of the court). Aerin begins as your typical ugly duckling, isolated outcast, and grows into a person confident in herself and her abilities (paralleling the author's growth as a writer?). For myself, what made Aerin a more compelling and interesting character than The Blue Sword's Harry was the bitterness that McKinley mixed with the sweet. Aerin couldn't simply find her prince charming but found herself torn between Tor and Luthe; Agsded wasn't a cipher like Thurra but was Aerin's uncle; Tor becomes king and marries Aerin but Arlbeth dies; etc. The Blue Sword reads too much like a fairy tale, and I never entered into the personal life of Harry to the extent I was able to with Aerin. This curmudgeonly stick in the mud recommends The Hero and the Crown with more confidence and enthusiasm than The Blue Sword, though both are good. PS - Can I complain, yet again, about the inadequacy of the rating system? I gave both this book and The Blue Sword three stars but they're very different three stars. If I were comparing these two books alone, Hero would get four stars because it is, IMO, that much better than Sword.